Start with clean hands. You don’t want to introduce any additional germs into the eye area. Use a clean washcloth or cotton swab or gauze pad. The big thing is that it’s clean because, see above. 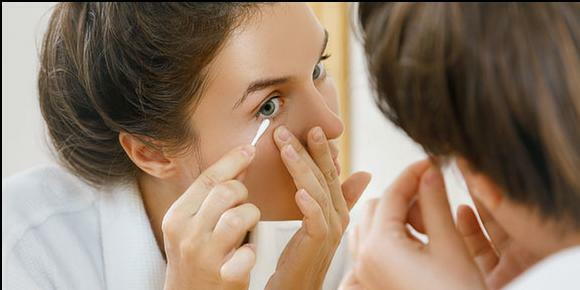 Gently wipe your eyelashes and lid margin (for your makeup experts, they also call this the waterline). Repeat on the other eye with a different clean cloth, swab or pad. If you do happen to develop blepharitis, give us a call. We’ll take a look to confirm that’s what’s bothering you, and we can give you some tips for reducing inflammation and making your lids happy and healthy again.